I adore Tom Hiddleston just as much as the next fangirl, but from searching The Hollow Crown on the internet one would think he was the only person involved in this series, and that frustrates me a little. I love that the presence of Tom Hiddleston in these adaptations is encouraging people who may never watch Shakespeare to see them, but believe it or not there is an entire cast of brilliant actors aside from Hiddleston who are also making the series amazing. Richard II shockingly had no appearance of Tom Hiddleston at all (*GASP*) and yet was still extremely well done. I had not seen Ben Whishaw in anything previously, but was extremely impressed with his performance. Patrick Stewart was amazing, as always, as was David Morissey. I even enjoyed James Purefoy’s brief appearance (his speech before releasing Heath Ledger from the stocks in A Knight’s Tale is still my favorite scene of the movie). Richard II is not one of my favorite plays, it’s rather slow and uneventful in my opinion, but this adaptation was extremely well done. In Henry IV the ever-amazing Jeremy Irons portrays the King wonderfully; he is always a commanding presence onscreen. Harry Lloyd’s role was small, but I still loved seeing him (I am currently in the middle of watching Robin Hood and I am having a hard time believing the same guy who played lovable Will Scarlet also played the incredibly cruel and obnoxious Viserys Targaryen). 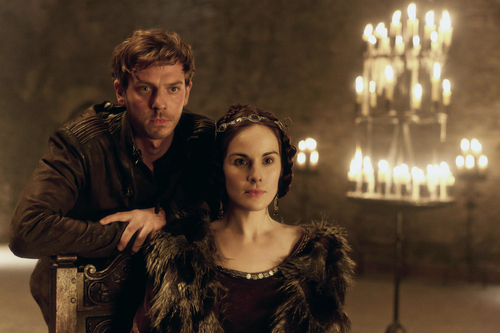 I loved Michelle Dockery as Lady Percy (even though her character irritates me in Downton Abbey, mostly because I still can’t believe Mary actually refused Matthew) but Joe Armstrong very nearly stole the show as Hotspur. Fans of British television will likely recognize Armstrong from Robin Hood, where he played Allan A Dale. Armstrong has little previous experience with Shakespeare, which makes Hotspur all the more impressive. He stood up well against the other actors who have had more Shakespeare experience in the past. His performance was certainly equal to Hiddleston’s and yet you hear very little about it because Hiddleston fans are too busy exploding in paroxysms of joy over Hiddleston’s laugh, or stare or whatever else they may be ogling at (and yes, I know perfectly well what you ladies are all looking at). The cinematography of the series is quite stunning as well, as are the costumes and sets and everything about these productions, but I have yet to find an un-biased (non-Hiddleston focused) review of them anywhere online. As much as I love Hiddleston, it makes me sad that such brilliant performances and work are being overshadowed by his mere presence in them. Ladies, I know this may seem hard to believe, but Shakespeare did not write his plays just so they would someday be performed by Tom Hiddleston (I know, it may seem that way, but it simply isn’t true). The overall intention for this series is to celebrate England’s culture and history in the days leading up to the Olympic Games. I’m glad people are watching, even if it’s for Hiddleston, because maybe it will expose them to a part of culture they were not previously familiar with. But here’s a bold idea: why not take it a step further? If you haven’t already, try reading one of the plays. (I recommend starting with the Henrys, as they are more engaging than Richard II.) If the language is intimidating, Sparksnotes makes great “No Fear Shakespeare” versions, with the original text side by side with modern English. Also, I’ve found that reading the play before watching the production helps me understand what the actors are saying, especially when they start speaking very quickly with a version of English I’m not overly familiar with. As I said before, I love Tom Hiddleston. But there’s so much more to this series than Tom Hiddleston, it’d be a shame to let it go to waste and not take time to truly appreciate all the hard work and brilliant acting that has gone into making it amazing.